Without a question, Tower is a leader in the industry of inflatable paddle boards and that is a hard-to-earn title. Truly, in order to attain its current status, this brand had to invest so much in quality and user preference, resulting in some of the greatest iSUPs to ever roam the market. When comparing Tower Adventurer 1 vs. Adventurer 2 side-by-side, there are a lot of similarities, like solid build quality and performance, but there are some differences too—some subtle, others, not so much. 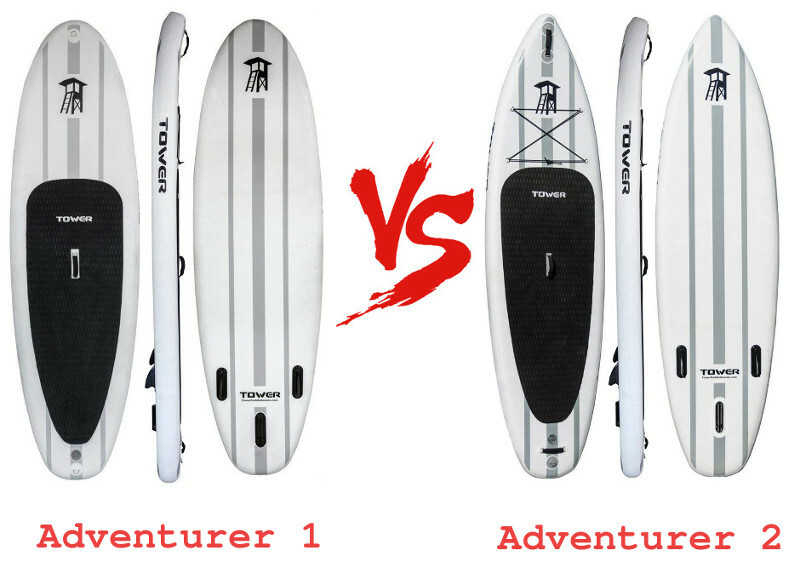 In this post, we pit Tower Adventurer vs. Adventurer 2 inflatable paddle board, to see which board is best-suited for you. First, before you even consider picking a board, you must be fully aware of its dimensions and the effect that will have on you and your experience. Accordingly, this segment will detail exactly what you should know about these 2 boards and how their sizes are highly defining. Initially, every iSUP is given a certain length and that will decide which category it belongs to. 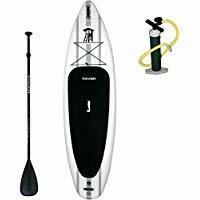 For example, the Tower Adventurer 1 comes at a universal 9 feet 10 inches in length with round edges, making it the best choice for young / adult beginning paddlers. This board will be easier to handle and far less demanding than a larger board. On the other hand, the Adventurer 2 is a step higher on the latter of proficiency. Indeed, the 10 feet 4 inches long iSUP has a completely different profile with narrow ends and a meaner look. Hence, while it still caters for both young and adult paddlers, this board is definitely not for someone who has never been on a board before. In terms of width, the Adventurer 1 comes at an impressive 32 inches, making it even more stable and granting you more room to roam around freely on board. Indeed, at this width, any beginner would be able to handle the board and stay on top regardless of the environment. On the other end, the Adventurer 2 also comes at 32 inches in width but its design is still prominent, giving this board an edge. Thus, the iSUP at hand is definitely designed to be stable. However, it is still highly responsive and significantly more sensitive to the paddler’s reactions. Concerning thickness, the Adventurer 1 commits to the strict 6 inches habit that was devised by the brand to make all of its boards more resilient and also capable. Indeed, rounding up its dimensions, the Adventurer 1 will be able to handle up to 220 pounds easily. As far as the Adventurer 2 is concerned, 6 inches in thickness is a given but since it is longer, the board will be capable of pushing through more weight. Indeed, the weight capacity of this board goes over 240 pounds without a struggle. 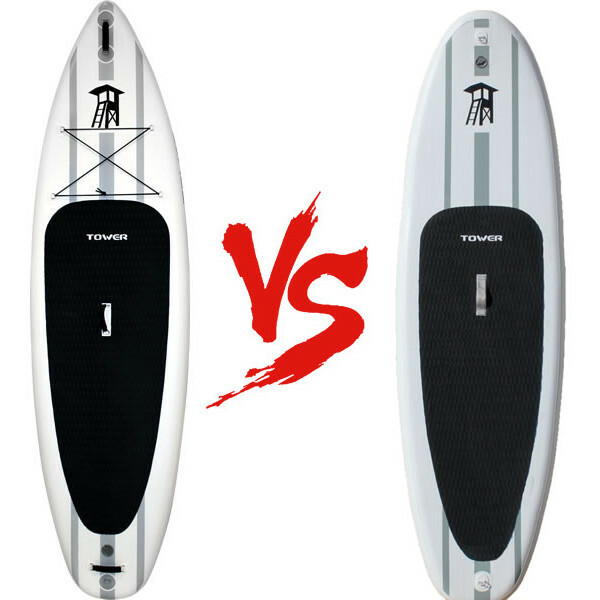 On the quality scale, both paddle boards are equally tough since they are made exactly the same way with the same materials. 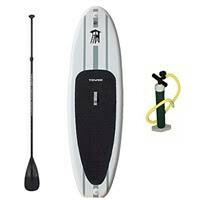 Hence, Tower paddle boards feature a puncture repellent coat, consisting of multiple layers of military grade PVC. These layers are different in shape and thickness to create a dense diversity that keeps these board as light as a small pet & as rigid as an actual hard board. However, high grade material requires high end production which is why the company chose to go for a double end drop stitch construction to pull those seams tightly together, leaving no room for flaws or punctures. The process is so efficient as it aims for the highest number of stitches per square inch, making these boards virtually indestructible. Features is also an area of agreement for both Adventurers (1&2) since they feature similar specs with a slight advantage for the Adventurer 2. Hence, here is what you should expect to find on both boards. Both Adventurers will come with a premium anti-skid gripping pad that covers the largest area on the platform. Hence, you can pretty much roam around and adjust yourself comfortably as you go with no risk of slipping off. The pad will also come in handy once you want to get back on top of the board. Further, both boards feature a similar central carry handle to help you transport these iSUPs individually once inflated. However, the Adventurer 2 features an extra two on each end to make it possible for 2 people to carry it at ease. In terms of navigation, both Adventurers actually feature the same triple fin system which allows for straight tracking and smooth gliding, reducing the sharpness of the paddler’s reactions. Nonetheless, the Adventurer 2 comes out on top as it individually features a 4 D-rings cargo net that will help you secure your paddle, snacks, coolers, or anything you need within your range. Luckily, both boards come equipped with a safety leash attachment D-ring on the tail. Performance is a high commodity for iSUPs because nobody wants a stiff board that would limit their motion on water. Hence, it would be safe to argue that while the Adventurer 1 excels at stability and reliability, the Adventurer 2 is more responsive and quicker to snap under commands. Nonetheless, it is also important to note that the Adventurer 1 is designed with a complete beginner in mind whereas the Adventurer 2 aims for a slightly more experienced paddlers that are capable of manning a board and capable of taking it to the next level.